Wed, Jan 16, 2019, 09:51 pm SL Time, ColomboPage News Desk, Sri Lanka. 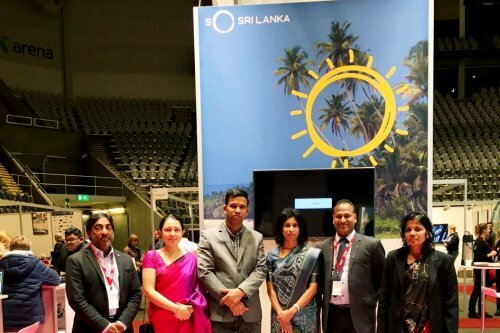 Jan 16, Colombo: The Sri Lanka Embassy in Oslo and the Sri Lanka Tourism Promotion Bureau organized and coordinated Sri Lanka's participation at the premier Nordic Tourism Fair - 'Reiselivsmessen 2019' held from 11-13 January 2019. Mr. Rizwan Wadood from "Silver Tree", Mr. Sugeeswara Dissanayake from "Ceylon Trails" and Mr. Arushan Lazarus from "Explore the Wonders" participated in and represented the Sri Lanka Travel Trade at the Fair, Ministry of Foreign Affairs said. The event was well attended and provided the opportunity to showcase Sri Lanka's rich cultural heritage and unique facets to visitors. Children from the Sri Lankan expatriate community performed a dance item which demonstrated the vibrancy of Sri Lanka's cultural traditions, which attracted a number of visitors to the Sri Lanka stall. NRK TV 2 of Norway interviewed Sri Lanka's Ambassador to Oslo Prof. Arusha Cooray, and telecast the cultural performance by the children on 11 January 2019 giving wide publicity to the Sri Lanka Stand. The attractive Sri Lanka pavilion drew a large number of visitors, all of whom were served with a cup of 'Ceylon Tea'. Tourist arrivals from Norway to Sri Lanka have been increasing during the last few years. The participation at 'Reiselvsmessen 2019' is expected to give a further boost to Sri Lanka Tourism in Norway and the Nordic region.